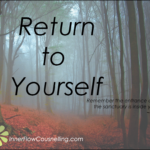 This is for you if you want to enter therapy for your past traumas but feel unsure about the process. 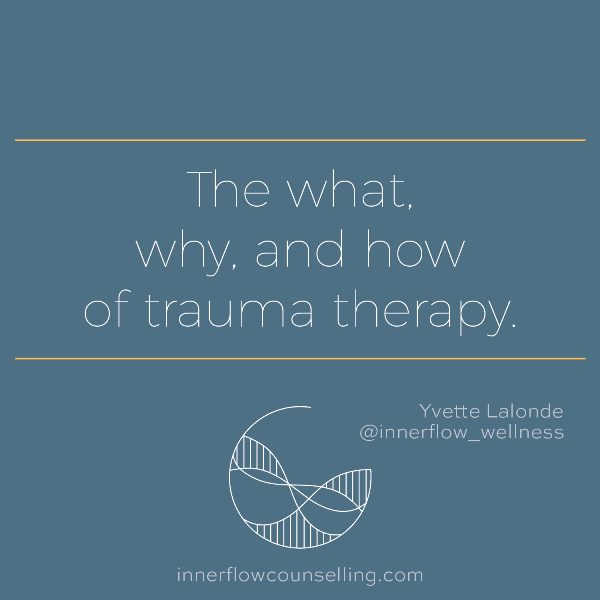 Many of my clients sigh with relief when I explain that we won’t be jumping into talking about and processing their traumas immediately. Here’s why. One of the best working definitions of traumatic stress is anything that you experience as being deeply distressing; any experience where your nervous system is unable to find resolution or you don’t yet have the resources to handle the stress. In other words, any experience that is too much, too soon, or too fast. When you enter into therapy, especially with a new therapist, the priority has to be stabilizing and building a foundation from which to start healing. If therapy moves too quickly into exploring and processing trauma, it can be more harmful than beneficial. In the 1800’s Pierre Janet and more recently Judith Herman (1992) specified the three stages of trauma therapy. What follows is an adaptation of their influential work and my inclination towards a neurobiological perspective. I explain this in terms of building a house. Before building up – framework, walls, and fixtures – you need to ensure that you have a solid foundation. This is a bottom up approach, from a psychotherapy perspective this means we work from the body up to the mind. Simultaneously, we employ top-down methods, working with how thoughts and beliefs about yourself impact your well-being. It is an integrative and organic process meeting you where you are at. I believe the foundation of the therapeutic process to be based on understanding how your unique nervous system (brain included) responds to trauma. Throughout the process you learn tools and techniques to regulate your nervous system so that you are, more often than not, engaging in your life from an adaptable, clear-headed, and appropriately boundaried place. This is not a linear step to step process, it’s normal to shift back and forth through the stages. Implementing functional tools and techniques to aid in nervous system regulation and symptom reduction. 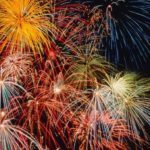 This phase of therapy is deeply rooted in self-exploration, self-compassion, and education about your body systems and mental processes while taking into account social influences. It is a creative process where we learn to understand your unique brain and nervous systems and how to regulate it together through present moment awareness, self-soothing techniques, and mindful movement. This may sound technical, but it can be a deeply spiritual experience. In essence you are developing a relationship with your nervous system and re-establishing your innate strengths and desires. This can sometimes lead to exploring your world view and understanding your sacredness. *Adaptive strategies are intelligent ways in which you’ve automatically learned to adapt to your environment in order to survive and thrive. As you mature and engage in more complex relationships these strategies begin to no longer serve you the way they use to. These strategies are linked to physiological responses as well. Our task is to implement more sustainable and supportive strategies that can be easily integrated into your daily life. 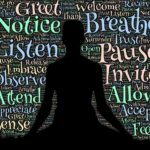 Adopting these strategies will naturally allow you to shift away from those that are harmful and not sustainable. Expanding your ability to stay in the present moment. In this stage the stabilization skills developed in stage 1 come into play to promote processing while in your window of tolerance (WOT). Your window of tolerance is a state in which you are able tolerate your memories, emotions, and thoughts as well as adapt to external stress. 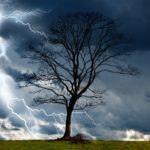 Nervous system regulation techniques bring you back into your WOT which helps build resilience, and rewires your brain and nervous system to respond to stress in more sustainable ways. *Sometimes traumatic memories become less invasive and the need to address them lessens as you progress through stage 1. 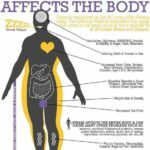 Freeing your body and mind from the trauma symptoms. In this stage of therapy you are redefining yourself and how you relate to your world. You are actively participating in meaningful relationships, achieving personal and professional goals that are founded in post-traumatic growth, and are able to successfully handle life’s inevitable stress. *Integration is a part of every stage. I like to ensure that you leave sessions with realistic and achievable tools that support you in your life. In this stage, integrating your trauma refers to it no longer being a daily focus; rather, it becomes integrated into your life story. Enlarged ability to handle and navigate life stress. Through the healing process I support clients in turning towards their bodies to process, to feel, to gain clarity, to release, and revivify. Initially this can be complicated by a nervous system that is more often than not in a state of dysregulation. In addition, we may have little capacity to describe what we are experiencing in our bodies. This can be confusing and lead to exacerbated hypervigilance and immobilization symptoms. This makes it hard for us to decipher between real threats and perceived threats. 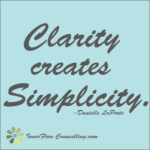 Being able to describe what we feel is an important part of making sense of our experiences. To do this we need to have the vocabulary to do so. Having the words to describe our sensations is not that common; in fact it is something that a lot of us learn in adulthood. Understanding and communicating our experience is a foundational component of healing and building resiliency. 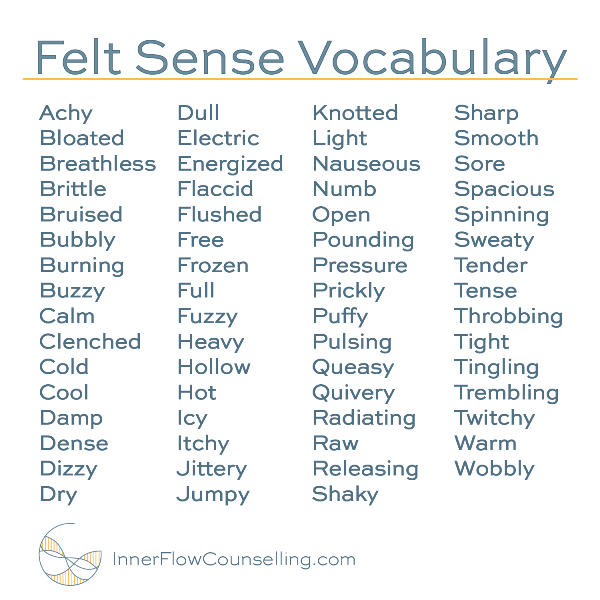 Just like how learning emotional vocabulary is important for emotional intelligence, so too is having a diverse somatic vocabulary to describe our felt sense. Why is a felt sense vocabulary important? 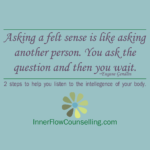 It helps us build a skill called interoception which is our ability to listen to and understand our internal cues. On a basic level it tells us that we are hungry or need to go to the bathroom and on a more fine-tuned level, interoception informs our perceptions and evaluation of people and situations. Combined with the information we take in from our external environment (exteroception) it helps us accurately measure our sense of safety or threat, known as neuroception. 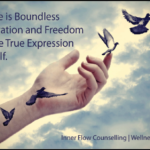 Having a better sense of self is supported by understanding our internal sensations and this is a skill I assist clients in developing in part through language. I’ve created a printable felt sense vocabulary list to help you find accurate words to describe your sensations. This is also great to teach children because when they can clearly communicate their experience they are less likely to get frustrated (just like us adults). This list is by no means exhausted; please add words as they come to you. I suspect kids will have some great suggestions. Self-worth. Self- love. Self-compassion. Self-care. Why is it so hard? Why is it so hard to feel worthy? Why is it so hard to feel deserving of love? Why is it so hard to stop critical thoughts? These are topics that come up frequently with clients and it’s a common struggle for adults who’ve experienced trauma in their childhoods. 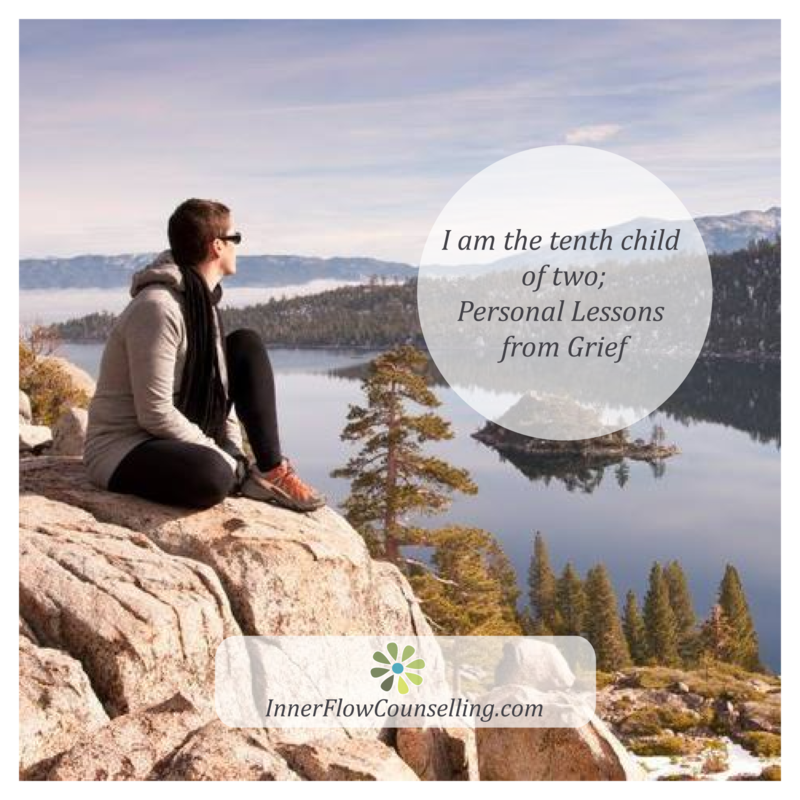 Trauma is anything that we experience as being deeply distressing; any experience where our nervous system was unable to find resolution and we don’t yet have the resources to handle the stress. The majority of people I work with have had childhoods where they didn’t feel inherently safe. All too often children in these environments learn to stand guard and keep watch anticipating the nuanced or obvious behaviour of their caregivers to try and keep themselves as safe as possible. This results in a nervous system that is kept on high alert for possible threat. The child learns to bypass their own needs in order to attend to the instability of their caregivers and/or home environment. Trying to find order amongst the disorder, children begin to internalize messages from their environment, families, friends, and society. Messages can be directly conveyed or inferred. It is input taken in without discrimination. Think of a child trying to understand the moral of a story that’s way too elaborate for their developmental stage. The child is simply trying to make sense and apply these lessons so they may better be equipped to handle life. This is about survival. A part of our brain called the limbic system stores and generalizes these memories so that we become more adept at detecting threat; this is a conditioned response based on survival and self-protection. In these types of environments children learn to internalize these messages as well as intense emotions. They become adept at repressing their feelings and numbing themselves to physical sensations. In this way children are split off from emotions and physical sensations that are vital for informing them what they require to feel safe and healthy; to sense boundaries in their own body. 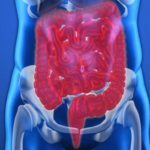 They learn to disregard the warning signs and cues that the body offers to aid in nervous system regulation. Enter the critical voice. One adaptive skill of trying to make sense of a traumatic childhood is developing a narrative that is critical of the self. This critical voice believes it is safer to target ourselves than to target anything outside of ourselves. In essence the violence is internalized; “on some level they firmly believe that these terrible things were done to them because they are terrible people” states Bessel van der Kalk. Think about this for a moment, this is huge! Trauma symptoms occur when our nervous systems are unable to find resolution. So, when we are unable to complete a fight response we may internalize the arousal symptom and experience self-criticism. When we internalize the avoidance response of flight we may self-isolate and when we internalize the intrusive stress response of freeze we may respond with self-absorption*. *Self-absorption refers to how symptoms from the stress response can become a preoccupation. If our early years taught us to negate our own needs for the needs of others, inhibit our emotional and somatic signals, and/or internalize messages that led to critical narratives, then how are we expected to know what we need, believe that our needs matter, and learn to care for ourselves? If we were not given the nurturing, care, or warmth that we required as children how can we expect to replicate these behaviours for ourselves as adults? It is not enough to try and change your thinking to a more positive outlook or buy some nice bubble bath. Though do these things too! Do the things that make you feel great because you deserve to. As you can see the impacts of childhood trauma are insidious and require a deeper level of care and attention than changing our external self-care habits or trying to think positively. 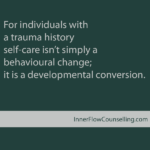 For individuals with a trauma history self-care isn’t simply about changing behaviour it is about looking at the undigested rules, beliefs, and narratives we still hold from society, friends, and family that get in the way of us connecting to our truth. It becomes a developmental conversion, exchanging old belief systems that were never our truths in order to find out what we truly value and who we are outside of the constructed belief systems. 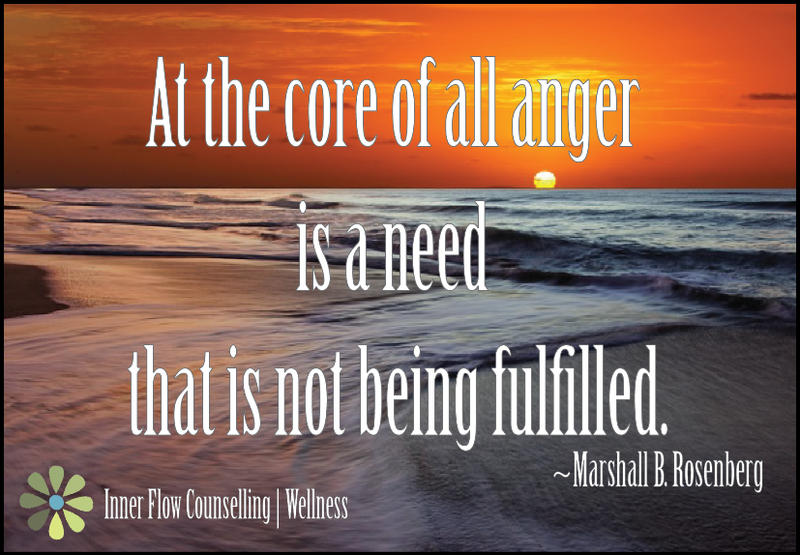 It is vital that we make contact with our emotional pain in a safe and nurturing manner. This may require the support of a trauma-informed practitioner that can help in unraveling and expressing what you as a child never got to. A trained professional can provide an honouring and compassionate environment where this type of work can happen and they can support you in regulating your nervous system, allowing you to stay present throughout your healing process. Ideally, therapy would include a somatic component since the body, brain, and nervous system store our experiences. 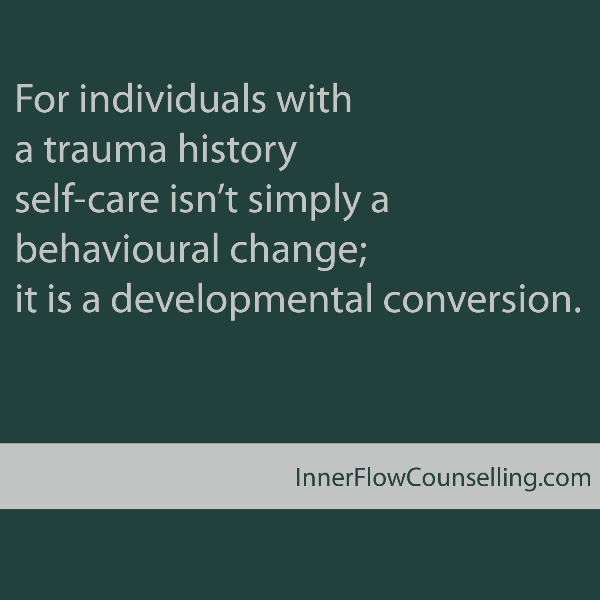 To heal trauma we need to engage our whole self’s body, mind, and spirit. It is a show of resiliency and strength to create a support network that supports you along your journey and helps you develop your own vitality. 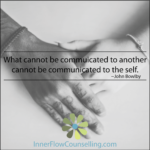 Nonviolent Communication (NVC) is one of the most useful skills I have ever learned. 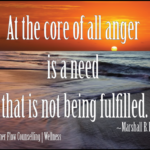 The creator, Marshall B. Rosenberg, has used NVC in war-torn areas as a way to find peaceful resolutions. This is a testament as to how it can help us improve communication in our personal and professional lives. NVC is about building connection, understanding, and respect; it is a life-serving communication tool. It requires us to engage in self-exploration by figuring out what our needs are. Knowing our needs is one of the most profound abilities we can learn and is applicable to more than just this communication style. Knowing our needs provides us with a grounded sense of self-awareness, it helps us set appropriate boundaries, and is the foundation from which we make requests from others. 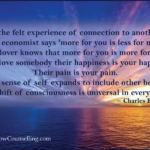 NVC requires us to ask the people in our lives to meet our needs so that we begin to feel content and supported. There are 4 steps to nonviolent communication for both the giver and the receiver. The giver is asked to honestly look at what they are feeling, needing, and why they are making their request. Requests are a personal preference which is different from a demand – demands come with consequences or expectations. The giver has to be willing to negotiate their request. The receiver is asked to listen with empathy, without hearing blame or criticism and then to repeat what they heard from the giver, confirming or clarifying until both are on the same page. Here are two PDF files to support you in enhancing your NVC skills. The first will help you expand your vocabulary with Feeling Language and the second is a Needs Inventory to support you in defining your needs. **To learn more I highly recommend the book Nonviolent Communication: A Language of Life by Marshall B. Rosenberg or this online training course.